The Homestead 1835 offers everything you need for a memorable destination wedding. We accommodate each bride’s unique, personal wedding style and vision while also creating a seamless, planning process. Dream and create your vision with our in-house decor options; choose and customize your menu with our in-house catering team; and relax knowing that our coordination services have attended to the details. Your wedding will have the unique and special touches that you have envisioned, creating memories for you and your family that will last a lifetime! With service excellence as our hallmark, we are more than just a venue … we’re committed to making your dream a reality! The Bride’s Room and Groom’s Room each accommodates six people comfortably. The suite offers air conditioning, make-up area, dressing area. Located adjacent to the ceremony site, this open-style building is used as a staging area for the wedding party as they prepare to walk down the aisle. Also adjacent to the fire pit area, it is the perfect place for a S’mores Bar. Other unique ideas for this space: a selfie station, photo booth area, and a cigar lounge. Fire Pit- Venue personnel will light and attend your fire. Wood provided. Note – food and beverage are not included in the above rates. Please see below for food and beverage information. The Homestead 1835 is proud to partner with LaSalle Catering, our exclusive in-house food and bar service, to provide outstanding food and exceptional in-house catering service. We do allow outside vendors for other speciality foods for your event, including wedding cakes, espresso bars, etc. Our menus showcase classic favorites & new dishes alike; they highlight the best seasonal, locally sourced, sustainable ingredients we can find. Artisanal foods and drinks made just for your special day. Our in-house decor inventory offers clients personalized decor options. Lighting decor, ceremony site decor, s’mores and popcorn bars are just some of the services available. In consultation with our team, you can design a decor package that reflects your own, personal style. Your wedding will have the unique and special touches that you have envisioned, creating memories for you and your family that will last a lifetime! Visit our Floral & Decor Page to learn more. 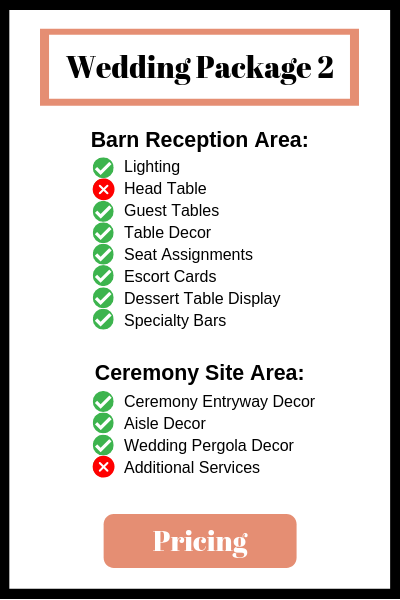 Please complete the form below or call us at 574.344.3248 to schedule your private venue tour. We look forward to helping you make your wedding day beautiful and memorable!